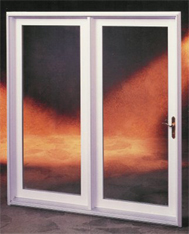 Full one-inch Tempered Insulated Glass for superior insulating quality and sound reduction. 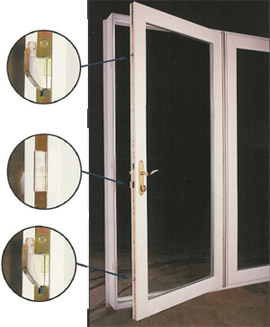 Removable glazing stops make glass replacement easy if needed. Fusion welded multi-cavity vinyl frame and panels for strength and long service. Sloped anodized aluminum sill cover provides increased threshold durability. High performance Q-Lon weather-strip around the perimeter of active and inactive panels for maximum resistance to the elements. Frame receiver grooves accept optional snap-on accessories for maximum versatility. Total frame depth of 5-15/16", with 4-9/16" set-back from new construction nailing fin. Extruded vinyl frame astragal provides strength and rigidity. Full length anodized aluminum gear type hinge virtually eliminates panel sag. Extruded vinyl drip mold to drain water away from the threshold (not shown). Attractive solid brass mortise lock handles with center deadbolt and key lock. The West-Vinyl Swing Door utilizes a high quality latch mechanism that employs an ingeniously designed multi-point locking system. This system assures tight closure by keeping the top and bottom of the panel held tightly against the frame in even the most demanding conditions. To engage the multi-point locks, simply lift up on the solid brass handle once the door is fully closed. 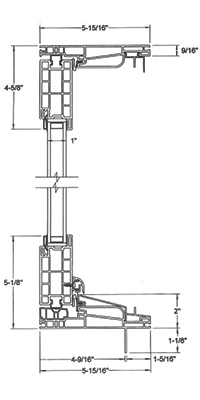 For an added measure of security, the West-Vinyl Swing Door also has a conventional key operated deadbolt lock. Compare the quality look and feel of the West-Vinyl Swing Door and we think you'll agree that the innovative design and superior components used make it one of the best on the market today. Extruded aluminum screen with adjustable wheels at top and bottom for smooth operation. Aluminum Flat Grid or Aluminum Contoured Grid between the glass. 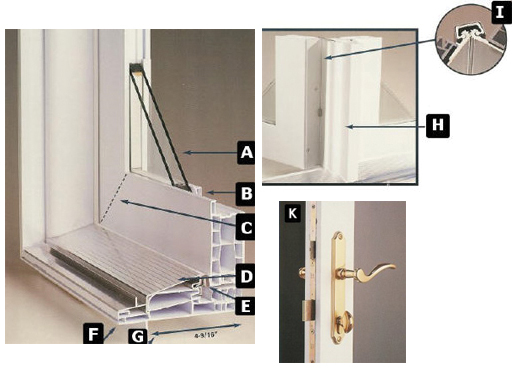 Several vinyl snap-on accessories to enhance the versatility of the West-Vinyl Swing Door. Matching side lights and transoms are available. 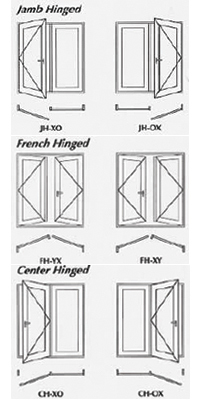 Available in Center Hinge, Jamb Hinge, and French Hinge in both In-Swing and Out-Swing models.